In many homes, the kitchen is a room generally reserved purely for practical use. Often a sterile-looking interior whose primary function is to provide a pragmatic catering space, it’s easy to overlook the kitchen as a simple means to an end. In this post, we look at how to bring the kitchen back to its rightful place as the heart and soul of any home through the implementation of contemporary style and technologies. As technological advancement continues to grow at an increasingly rapid rate, embracing cutting-edge technologies in aspects of your home can completely revolutionize any interior. Smart kitchen gadgets come in all shapes and sizes to perform an astonishing array of automated functions. Multi-purpose devices such as smart ovens simplify the cooking process exponentially, with capabilities ranging from built-in ingredient recognition software (to ensure you’re following recipes correctly) to automated updates on the progress of your cooking, sent directly to your smartphone device. Embracing these kinds of technologies in your kitchen appliances is an effective way of creating an incredibly efficient interior space that goes far beyond the usual realms of practicality, ensuring your kitchen becomes a pinnacle part of the home. The best way to move your kitchen away from an isolated functional role is to revitalize its hosting capabilities. 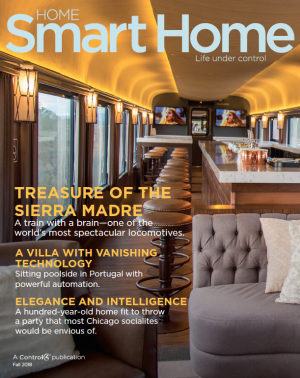 Smart entertainment solutions, such as those provided by Control4, offer a great way of moving the kitchen from a neglected purpose-focused room to a lively social hub. Boasting every-room audio and multi-room video features, the Control4 smart home system can instantly stream music or video to any room in your house while simultaneously setting the mood with preset lighting scenes and giving you total control of your home. With a kitchen now locked and loaded with the latest and greatest technological capabilities, you need to ensure the aesthetics are on par with the functionality. As such, consider an interior overhaul, ridding the room of its sterile style in favour of a chic, modern design. There are multiple approaches you can take to pull off a contemporary interior style worthy of the state-of-the-art tech now contained therein. Consider a dark interior colour scheme with classic opulence, combined with a futuristic shine to achieve a seamlessly smooth overall aesthetic. For example, combining some timelessly stylish kitchen tiles with a glitzy kitchen worktop will create a subtle contrast between flooring and surface that will seamlessly fit a wider modern aesthetic. Look to incorporate urban styling with features such as exposed wire lighting, and contrast with futuristic metallics for a kitchen that looks, functions and feels straight from the 22nd century. You might even consider intelligent lighting solutions, also from Control4, to add smart control solutions to incredible lighting scenes that transform your kitchen with ambiance. Following these tips will ensure your kitchen is no longer an interior afterthought and will help you transform it from a room with a mere single purpose to a multipurpose space with contemporary function and lasting style.